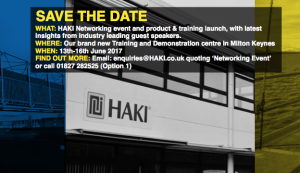 HAKI hosted a successful networking and product launch event at their brand new, state-of-the-art training and demonstration facility in Milton Keynes in June. HAKI also took the opportunity of doing live demonstrations of their lightweight Universal system scaffolding, weather protection and all-new-for-2017 Public Access Stair (PAS) Tower, revised HAKI Bridge System (HBS) and HAKI/Safway’s QuikDeck systems. The event schedule also included talks on scaffolding in construction, rail, heritage, river and canal projects, ridging and Infrastructure, oil and gas, sports and events and much more.